Skyrim is out now on Switch and in VR, and that’s two more excuses to build a necromage vampire. One of Skyrim’s most powerful builds is the necromage vampire, an incredibly powerful stealthy magic user many players overlook. We’re republishing our Skyrim guide to celebrate the Switch and VR releases, and this page is one that beginners and veterans alike could stand to get across. 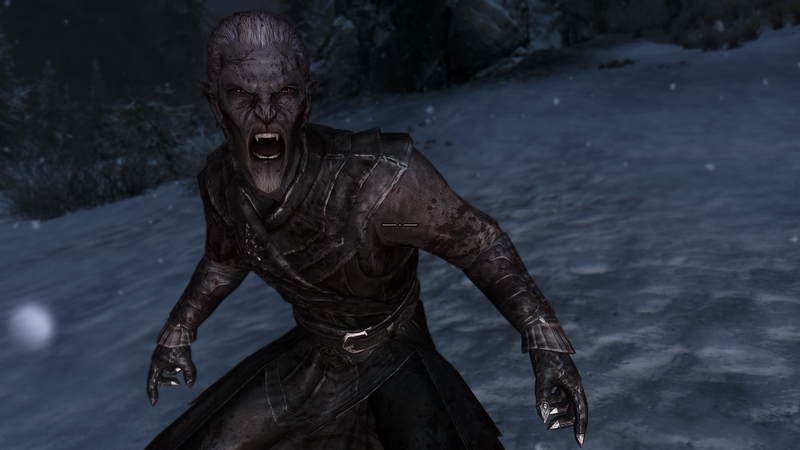 Read on for all the details on how to become a necromage vampire, perhaps Skyrim’s most powerful build. Let’s go through these steps in order. Becoming a vampire in Skyrim has its pros and cons. Sure, everyone hates you, and going outside during the day is a serious health hazard, but the perks are great for sneaking around and if you play your cards right, you can create arguably one of the strongest builds in the game. But first, you have to become a vampire. You can contract a disease called Sanguinare Vampiris by being attacked by a vampire or by being exposed to vampiric weapons. If you’re already a werewolf, you’ll be immune. Hircine’s Ring will also make you immune. First of all, grab the Necromage perk in the Restoration tree. With that under your belt, start building up your character with the perks listed below. Make sure you don’t take any of these until after you become a vampire, or you won’t get the associated bonuses (see step three below). Once you’re a fully-fledged vampire, you’ll be immune to disease and poison, be hugely resistance to frost and 25% more difficult to detect when sneaking. But there’s more. As a vampire, your character is flagged as undead by the game, so you can totally take advantage of the Necromage perk in the Restoration skill tree. This perk increases the effectiveness of all spells and effects against the undead, so now that you’re undead, it’s going to buff the crap out of you. Spells, effects, and equipped enchantments are increased and improved by 25%, and last longer by a full 50% so this build is hugely advantageous. It even works with Fortify Alchemy, allowing you to break through the 29% cap, feeding into the alchemy-enchanting loop. Just to reiterate, the perks that are affected by the necromage vampire build must be taken after you’re a vampire and after you’ve unlocked the Necromage perk in order to see the benefit of the build. By the by, if you want something to do with your perk points while you’re chasing vampirism or after you’ve tapped out the perks above, the necromage vampire has excellent synergy with our dual wield Skyrim build, too. You can absolutely push for both. Got your own favourite Skyrim build? Share for new and returning players on Switch and VR platforms.